Note: this history section only goes up to about the year 2000. We are working to bring it up to date to 2014. WIPP goes back to 1957 when the National Academy of Scientists recommended bedded salt formations as the best type of formation for underground disposal of radioactive waste. The actual impetus to go forward with the project came in 1969-1970 when a series of fires at the DOE Rocky Flats facility near Denver, Colorado caused airborne releases of plutonium over parts of the city. DOE agreed to stop storing plutonium wastes at Rocky Flats and began shipping transuranic wastes (TRU-wastes) to Idaho National Engineering Environmental Laboratory (INEEL) in southeastern Idaho. Idaho was promised that the waste would only be stored for ten years in Idaho and the search was on for a site where these wastes could be be permanently disposed. After 1970, DOE began to store TRU-waste retrievably at all their facilities in anticipation of the opening of this permanent disposal facility. DOE had previously looked at a site near Lyon, Kansas--an abandoned salt mine--but strong political opposition by state officials and a combination of numerous poorly plugged boreholes and large volumes of water "lost" in fractures in the salt forced them to look elsewhere. They considered several New Mexican sites and eventually settled on the site near Carlsbad. The encouragement of local politicians and businessmen was an important factor in bringing WIPP to this area. In fact, early surveys in Carlsbad and southern New Mexico showed a 3 to 1 response against WIPP. Local people were particularly upset about how their concerns about the project were being ignored. Consistent support by local and state politicians as well as the depressed economic conditions in that part of the state, however, combined to push the project forward. In 1978 and 1979 there were additional concerns about DOE's plan to store high-level waste at WIPP. Early plans showed a repository with 2 levels--the lower level for hotter defense wastes and 1,000 commercial spent fuel rods. In 1978, then Energy Secretary James Schlesinger tried to mollify these concerns by promising that New Mexico would have veto power over WIPP and that the facility would be subject to Nuclear Regulatory Commission (NRC) licensing. This was one of many promises to the state that would be broken. Because WIPP was a military project it came under the jurisdiction of the Armed Services Committees in Congress. These committees did not want an outside agency interfering in what they saw as National Security, so they opposed NRC licensing and state veto power. In 1979, the annual DOE authorization bill was amended authorizing WIPP. High Level Waste (HLW)--fuel rods and waste from reprocessing--was excluded from permanent disposal at the site, but was allowed for "experiments". Also, the Armed Services Committees were able to have state veto power and NRC licensing specifically forbidden. Veto power was downgraded to "consultation and cooperation" with the State. The Carter administration was not enthusiastic about the WIPP project and stalled it throughout 1980. DOE's Final Environmental Impact Statement (FEIS) on WIPP which came out late that same year, called for the site to be compared with others for HLW disposal and for the project to be delayed. But 2 days after Reagan took office in 1981, his administration announced that the project would go forward again, as before, and proceeded to start underground mining and construction. At this point the State of New Mexico filed suit to stop WIPP from proceeding as planned. The suit was settled out of Court with a Stipulated Agreement between the State and the DOE. In this agreement the state agreed to allow permanent facility construction and underground excavation. DOE agreed to do certain tests as well as to allow independent state monitoring. DOE also agreed that the TRU waste would be subject to a period of retrievability before the repository was closed. In addition, a Consultation and Cooperation (C & C) Agreement was signed between the DOE and the state of New Mexico. The tests that were done, among other things, led to the discovery of brine under the repository site which caused the site to be rotated away from the brine. (Unfortunately it ended up on top of more brine where it remains today). When construction began at the site several hundred people demonstrated at WIPP. Twenty-one people were arrested after crossing the WIPP site boundary line. 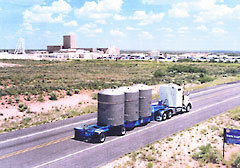 Late in 1982 Congress passed the Nuclear Waste Policy Act (NWPA). This Act stated that all HLW repositories would be licensed by the NRC and could be vetoed by the state in which they were sited (though the veto could be overridden by Congress). Again, WIPP was not covered by either of these processes. In 1984 the C & C agreement was partially modified (First Modification). DOE agreed to do more geological studies and agreed to comply with all applicable federal and state laws including Environmental Protection Agency (EPA) standards for permanent disposal of radioactive waste. The WIPP mission still included an amount of HLW for experiments, but the amount of RH-TRU waste that could be disposed was limited and described in this agreement. Retrievability of wastes before permanent disposal was again spelled out. In 1987 a federal court threw out the current EPA standards for being too weak. EPA began to research and rewrite the standards, but by this time it was becoming apparent that WIPP would probably not meet even the old requirements. It was known that the salt at the site had water in it and that there were numerous other problems with the site and the waste. At this point DOE declared that WIPP would be opened for a "Test Phase" and that 15% of the wastes would be "stored" at WIPP for tests. Since the wastes were only stored and not permanently disposed, they would not be regulated under the more stringent EPA standards for permanent disposal. If, after 15% of the waste was emplaced, DOE decided to dispose of the waste, only then would they have to show compliance with disposal standards. Again, New Mexicans protested by camping on the sidewalk in front of Senator Bingaman's and Senator Domenici's offices for a week. In this same year DOE tried to get a variance from the Department of Transportation for the poorly designed TRUPACT-I shipping container. When this failed they agreed in the Second Modification to the C & C agreement to get NRC certification for future shipping containers. They also agreed again to comply with EPA, DOT and NRC regulations relating to WIPP and that they would try to get $190 million for road improvements and bypasses. Other agreements included not allowing mining and drilling into the WIPP site and that both natural and engineered barriers would be used to confine the waste. Governor Carruthers declared that this Second Modification had resolved state concerns. DOE began the process to withdraw the land around WIPP from general use and put it under exclusive DOE use. This was the first step toward actually opening the repository to receive waste and DOE announced that WIPP would open in 1988. However, the process of bringing the Land Withdrawal Act before Congress brought WIPP under the jurisdiction of committees other than the Armed Services Committees. When these committees held hearings, numerous problems with the site and the facility were revealed. Passage of the Land Withdrawal Act was stopped and in fact it took five years before the Act finally became law. Meanwhile, the Governor of Idaho refused to accept any more waste from the Rocky Flats facility near Denver. He later allowed a few shipments to continue but in 1989 DOE tried to come up with interim storage plans for the waste. Much had changed since the original 1980 EIS and after being threatened with a suit by several environmental groups and the state of Texas, DOE agreed to supplement the 1980 EIS and hold hearings. They also announced in the Draft Test Phase Plan that they would only bring 3-8% of the waste to WIPP for tests. Eight hundred people testified in the New Mexico SEIS hearings; most strongly criticized the project and the so-called Test Phase. The next year the Final SEIS was issued. In it DOE stated that it was "...committed to full compliance with RCRA requirements..." The RCRA requirements include regulation of the hazardous materials in the mixed waste. At the same time that DOE was promising full compliance, it applied for and received a variance from those requirements for the Test Phase. That same year DOE tried and failed to get the NRC to approve 24 defective TRUPACT-II shipping containers. 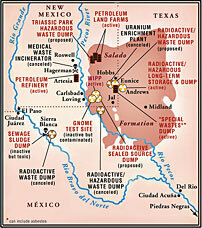 And it was also during 1990 that the New Mexico Environmental Improvement Board (EIB) held route designation hearings. The next year the routes to WIPP were designated by the state of New Mexico which chose to send the waste south on highway 285 for much of its journey. Throughout 1991 there was a struggle back and forth over withdrawing the land for WIPP. The DOE and Department of the Interior (DOI) made several attempts to withdraw the land administratively when various versions of the Land Withdrawal Act failed to pass. Administrative withdrawals were blocked by Representative Bill Richardson and by a lawsuit filed by the Attorney General and several environmental groups which resulted in a preliminary injunction against the opening of WIPP. The Land Withdrawal Act finally passed in 1992. It included provisions for a Test Phase but also that WIPP must comply with EPA regulations for permanent disposal(the Resource Conservation and Recovery Act, or RCRA) as well as with the Solid Waste Disposal Act (again--regulating the hazardous component of the mixed waste). DOE was required to help the State get money for highway upgrades and emergency-preparedness training and equipment. Retrievability plans as well as plans for decommissioning WIPP and surveys and plans for disposal of all TRU waste (including the large amount that is not retrievably stored) were required. HLW was specifically prohibited at WIPP--even for experiments. EPA certification requirements were key to the compromise that resulted in passage of the Act. DOE would no longer be able to self-certify the facility. Instead, EPA would decide if WIPP could safely contain the waste. The next year DOE at last admitted that it couldn't scientifically justify doing experiments in the repository with WIPP waste. It was clear that any needed tests could be better done in the more controlled environment of a laboratory. Also, DOE found that they couldn't seal the alcove rooms excavated in salt that were required for gas generation experiments underground. So in 1993 the Test Phase was canceled and the next year DOE began concentrating its efforts to open WIPP as a permanent disposal facility. in 1994 and 1995 they finally began to do some of the tests needed to understand the hydrology and geology of the area. These tests are crucial to showing compliance with permanent disposal standards, but since they were started so late DOE says they will be ongoing even after the repository opens. In other words, the results of the testing showing whether or not the site can actually contain the waste for the 10,000 year requirement won't be known until after DOE has started emplacing the waste underground! (DOE wasted almost a year and millions of dollars creating a complex computer model, the System Prioritization Method, to figure out how few tests they could do to show compliance with the EPA regulations).